and endorsed the Cinema Club sessions. All were received well and there has been a noticeable increase in attendance with each subsequent event. In May 2009, a COI staff survey was conducted to find out the level of awareness of our internal creative services. A significant number of people felt that they did not know enough about our creative services, and would like to know more and engage more with the process. The Creative Awards are a proposal to celebrate the creative output of COI, but most importantly they are a mechanism by which we can engage the whole organisation in the creative process. 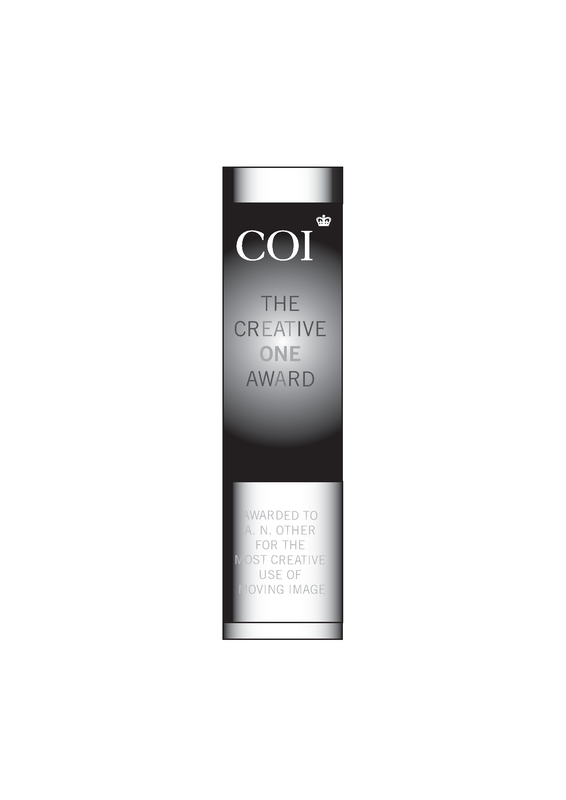 The COI Creative Awards are a celebration of the creative work from COI, whether produced internally or procured externally. They are designed to acknowledge those individuals and teams responsible for the concepts and various executions of creative ideas. They also include those individuals whose role significantly feeds into and influences the creative output. The Awards are for the best work in 2009. 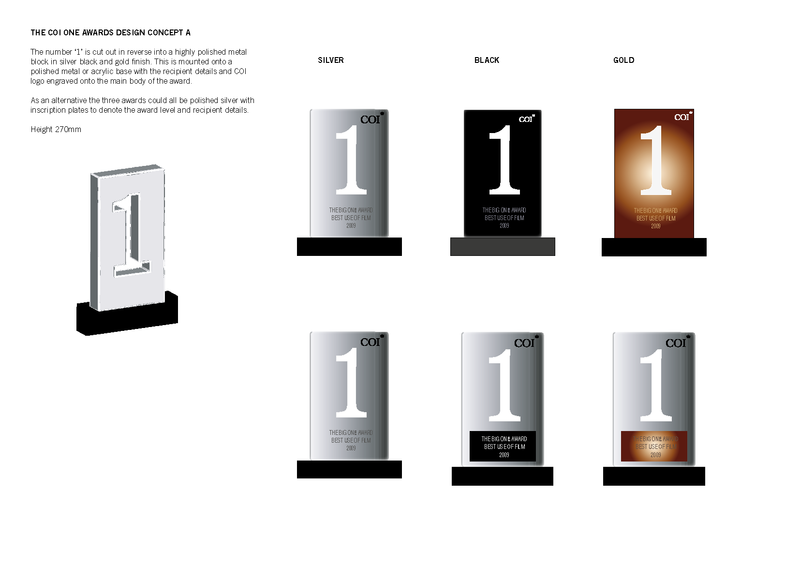 The Awards are called ‘The COI ONE Awards’, a theme reinforcing the new direction set for COI by Mark Lund, namely ‘One COI’. 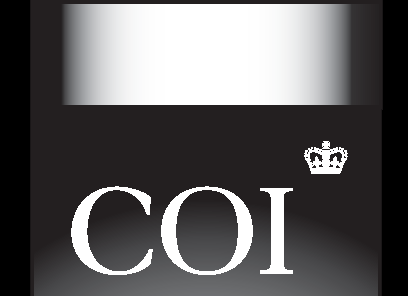 There are 12 award categories, designed to acknowledge the wide range of communication disciplines and channels in which COI currently operates. 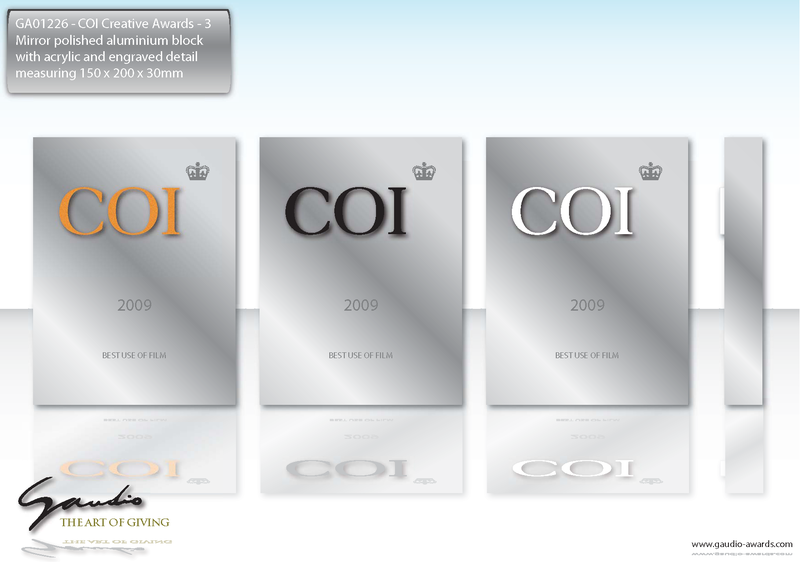 The final selection of category winners will be from the COI staff themselves, and the presentation of the COI ONE Awards will form part of the COI Christmas Event 2009. Mark Lund or a respected industry creative, such as Sir John Hegarty, will present the awards. The ONE ON THE WALL award. An award for the best pieces of work seen on a large scale, such as 48-sheet posters, electronic billboards, Adshels or simply A3 posters. These can be produced either by printing or digital methods of production. The ONE IN THE HAND award. 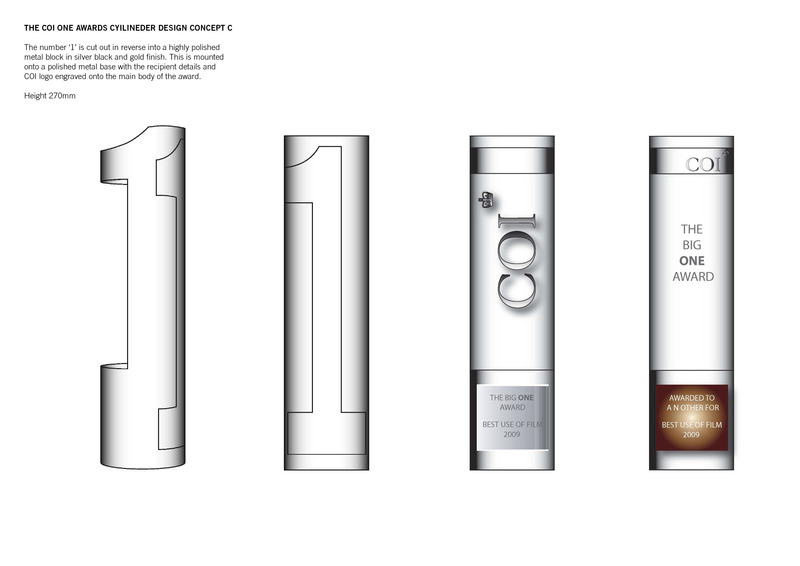 The ONE IN THE HAND award is aimed at the best piece of work that is intended to be seen or used in the hand. These will be predominately be in a print format, ranging from brochures, magazines and newsletters to direct mail, books, guidelines and toolkits. The SOUNDS LIKE ONE award. This award is for the best audio content, including radio commercials, fillers and podcasting. The BIG ONE TO WATCH award. The BIG ONE TO WATCH award is for the best long film, or any film over 2 minutes, that might be aimed at a cinema audience. The SMALL ONE TO WATCH award. This is the award is for the best short film, or any film under 2 minutes, that might be aimed at a TV audience. These will include commercials, fillers and podcasts. The ONE CLICK AWAY award This award is about the best piece of communication in a digital environment, ranging from website and content management, social media and user-generated content to SMS communications and other channels such as podcasts or blogs. The LIVE ONE award. 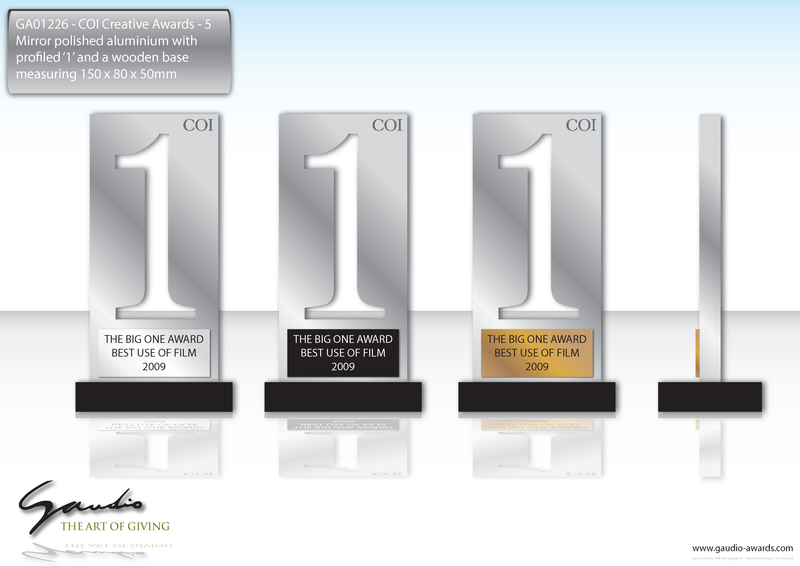 The LIVE ONE award is for the most exciting or creative live event. In this category entries will range from exhibitions and concerts to conferences and face-to-face promotional activity. The ONE TO ONE award. The ONE TO ONE award is for the best direct relationship marketing project, including sponsorship and direct mail communications. The NEWS AT ONE award. The NEWS AT ONE award is for the best news and PR. This can include articles, press releases and promotional strategies for both local and national stories or campaigns. The ALL FOR ONE award. 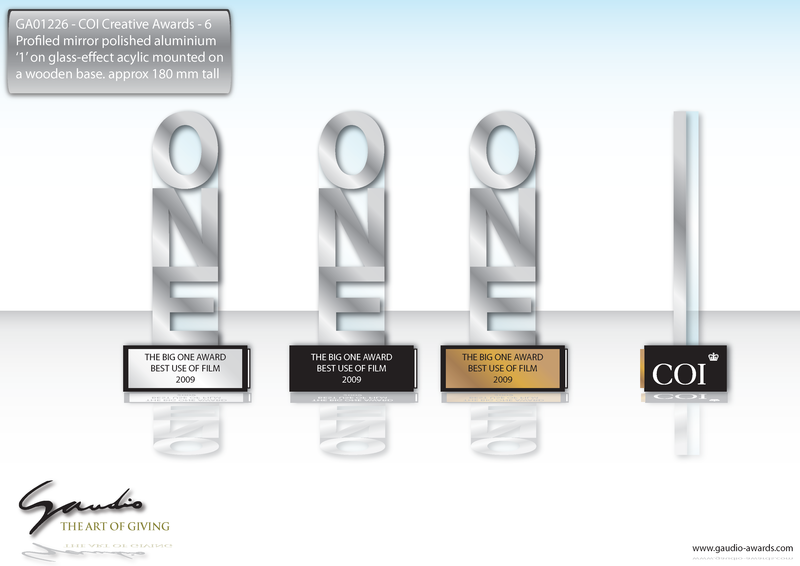 The ALL FOR ONE Award is aimed at projects or campaigns that are fully integrated. These must have a minimum of three different communication channels in order to qualify. The ONE TO THINK ABOUT award. This an award for someone who has been nominated as a creative thinker. The nomination could be a person who has significantly influenced the final output of the creative solution, or it could be someone who has thought creatively, to form a strategy that had a significant impact in the area of business in which they work. Effectively, anyone could be nominated from across COI staff. The BIG ONE award. This award is seen as the Grand Prix prize, the best of the best. This will be judged by either the Chief Executive, the Creative Champions Group or an external judge. 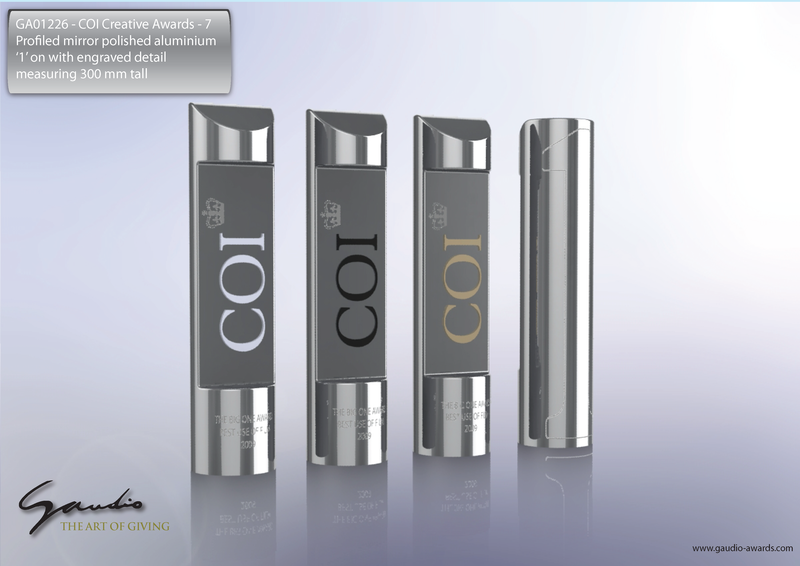 The Award is the COI ‘1’ Award. 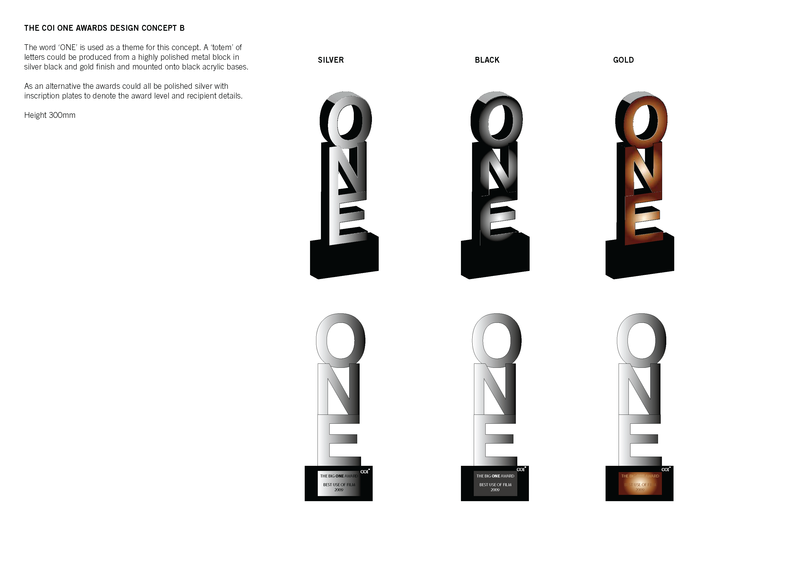 Work category winners receive a single white ‘1’ trophy plus certificates for all team members (the certificates will include all team members’names).People category winners receive a single black ‘1’ trophy. The Grand Prix winner(s) receive a single gold ‘1’ trophy. The judging criteria will be based on the strength of the concept, creative idea or execution. Each department responsible for delivery within each category is asked to nominate up to 10 examples (CAT to be responsible for nominations of integrated campaigns). A jury consisting of members of the Creative Champions Group and the relevant Specialist Director will then reduce these to three. The shortlisted work for the 11 work categories will be displayed in the ground floor meeting rooms 2 A/B/C/D as a Creative Showcase on the day before the Christmas Event, and all members of staff (and clients) will be invited to attend and vote on their favourite pieces of work. On entering the Creative Showcase, each visitor will be handed a voting form on which to indicate the choice of best work in each category. This form will be collected and the votes counted to determine the winner. The final decision of what wins in each category will be by the popular vote of COI staff. Chairman’s Award for Creative Thinking. The Chair of the Creative Champions Group will judge these entries and may co-opt any other members to a jury to assist as he sees fit. The presentation of the COI Creative Awards will be at the end of the day set aside for the COI Christmas Event and prior to any festive celebration that might ensue.